Dan Ettinger, who has spent the past five years as Daniel Barenboim's protégé and assistant, has been appointed to be the new music director of The Mannheim Opera House in Germany at the age of 36. The three-year contract is scheduled to begin in the summer of 2009. Despite his young age, Ettinger has acquired an admirable reputation as a conductor and music director from opera houses all over the world. But what led to his new contract was his most recent position assisting Barenboim, as house conductor of Berlin State Opera. "It was ideal," he says, "because it allowed me to stay for six months of the year with The Israel Symphony Orchestra in Rishon Lezion, which was very important to me. It also perfected certain things in me. I can see the fruits of my labor there very clearly." Ettinger became interested in conducting during his youth, as an opera singer. He began learning the hand movements from observation and books, and later received his big break in the business from the Israeli Opera. "During the last few years I also learned a lot from Barenboim and Berlin's wonderful orchestra. It was like driving a Mercedes," he remarks. 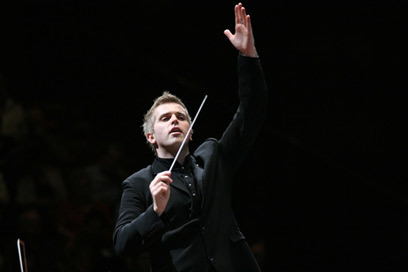 "I believe that conducting is not only composed of academic studies. It's about personality, and the ability to manage a group of people, to inspire them and make them reach their potential. This is not something you can learn, it's something you're born with. I am also a big believer in experience, which I think is more important than studying," he adds. Ettinger sounded exhilarated but in control during the interview for Ynet. Control should be extremely important to him during the next three years, with the tight schedule set to command his every move. "My schedule becomes more difficult every day. Sudoku is child's play compared to my calendar," he jokes. "But seriously, it's very flattering." Meanwhile, the Israeli Orchestra has expressed concern for Ettinger's apparent flight from the country, but he claimed: "It's important to me to continue my activities and influences in the country in which I grew up and spent most of my life." Ettinger received blessings and advice from Barenboim. "I never asked for a letter of recommendation from him, and negotiated the contract with Mannheim on my own," Ettinger said. "But I included him in the process and he gave me his blessing. He thought it was the right time for me to manage my own opera house." Ettinger hopes to learn much about the management and growth of opera houses in the next three years. "In addition I will continue to make myself known in other places, such as the Metropolitan Opera in New York, where I will be conducting The Marriage of Figaro, the Covent Garden Opera in London, and the Tokyo State Opera," he says. See all talkbacks "Israeli conductor to manage Mannheim Opera House"